The 01V96i offers up to 40 inputs and 20 busses with 24-bit/96kHz performance and outstanding studio-quality microphone preamps. Also on-board is a full suite of VCM effects and high-resolution REV-X reverbs. Other features include precise 16-in/16-out USB audio interface, motorised faders, scene memories and expansion options via MY-series interface cards. Includes Steinberg's Cubase AI DAW software. Sometimes everything just comes together—and when it does, the new 01V96i is there to capture that perfect moment for you in stunning 96kHz sound. Since its initial release in 1998, the 01V has been the mixer of choice for a wide variety of applications, ranging from recording and production environments to live sound and installation setups. The 01V96i represents the next step in the evolution of an industry standard, building on the proven configuration of its predecessors to create a compact digital mixer that meets the needs of an expanding user base. Now, with 16 in/16 out USB 2.0 audio streaming at an impressive 96kHz, the latest version of Steinberg's Cubase AI, the full suite of Yamaha's acclaimed Virtual Circuitry Modeling DSP effects and newly improved studio-quality head amps, the next generation 01V96i will take every aspect of your mixing and recording to the next level. Every Masterpiece Started with a Blank Canvas. Shouldn't Yours? At Yamaha, we believe that the signature on your sound should be your own, not ours. With this philosophy in mind, the 01V96i—like all of our higher-end digital mixing consoles—was designed to provide outstanding sonic transparency, giving you the purest signal reproduction possible as a starting point. With this clear, unaltered medium as the foundation, all of the color, shape and expressive elements of your sound are entirely in your hands. So now you've got your canvas— time to add color. Yamaha's acclaimed VCM effects faithfully model the analog circuitry of classic effect units right down to the very last resistor and capacitor, bringing the richness and warmth of analog to a digital environment. So whether you're bringing vocals to life with a classic Yamaha SPX reverb, or smoothing out a bassline with a classic compressor from the 70's, you can depend on Yamaha's flexible digital processing to produce stunning vintage authenticity. Unlike some digital consoles that achieve operation in 96kHz mode with a reduced number of tracks, 01V96i imposes no such limitations at any of the provided sampling rates, with high resolution 96kHz and 32bit internal processing (58-bit accumulator) as the standard. 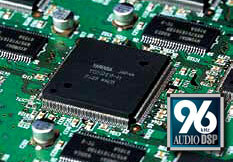 What's more, all onboard A/D and D/A conversion makes use of top-performance 24bit/96kHz converters. This is particularly important with the 01V96i because it features improved, studio-quality head amps that offer extremely high-resolution and a remarkable sense of “air”. With onboard converters operating at the full 24bits and 96kHz, you can be sure that nothing is lost in the digital representation of the warm, transparent output from these exceptional preamps. What's the point of having 24bit/ 96kHz audio if you have to convert down to a lower sampling rate for effect processing? That's exactly what's happening if you're using hardware or software processors that don't offer 24bit/ 96kHz performance anywhere in your signal chain. That's why Yamaha included a comprehensive range of 96kHz compatible stereo effects. The 01V96i also features flexible, independent channel compression and gating/ducking processors for dynamics control, 4-band parametric channel equalizers that offer extra versatility with switchable “type I” or “type II” EQ algorithms, as well as a channel delay. All channel processors, except for channel delay, come with an extensive selection of presets in a range of “libraries”that can simply be used unmodified or edited to suit specific requirements. All channel functions except gating are also provided on all output buses. The Channel Strip consists of 5 models that employ VCM (Virtual Circuitry Modeling) technology to recreate the sound and characteristics of several classic compression and EQ units from the 70's. Not only do these models faithfully capture the unique saturation of analog circuitry – in part thanks to precise modeling of the original FET gain reduction, tube/transformer buffer amplifier, VCA and RMS detector circuits – but they have also been fine-tuned by leading engineers and feature carefully selected parameters in a simple interface that makes it easier than ever to create the ideal sound. The Master Strip employs VCM technology to recreate both the analog circuitry and tape characteristics that shaped the sound of open-reel tape recorders. Because of their ability to smooth out peak levels and tidy up the response, many high-end recording studios still maintain open-reel recorders such as the Studer A80 mk I, A80 mk IV and A820, and the Ampex ATR100 and others from the 70's and 80's to be used to provide tape compression at the mastering stage. Different types of tape – new BASF, old Ampex, etc. – are also selected and used according to the unique sounds they produce. Open Deck provides models of four machine types: Swiss '70, Swiss '78, Swiss '85, and American '70. You can even combine different record and playback decks for a wider range of variation. You also have a choice of “old” and “new” tape types, tape speed, bias, and EQ settings that can vary the “focus” of the sound, distortion, and saturation characteristics. Now you can easily take advantage of top-end analog sound-shaping techniques in real time using the Yamaha 01V96i digital console. Stunning authenticity, that is. Vintage Stomp gives you three distinctly different phasers modeled after the most sought-after stompbox effects units of the 70's. Yamaha's VCM technology gives these outstanding recreations all the warmth and atmosphere of the original vintage units, and combines it with the control and processing flexibility that a digital environment affords. These high-resolution reverbs employ the latest "REV-X" algorithms first introduced in Yamaha's SPX2000 Digital Multi Effects Processor. The REV-X programs feature the richest reverberation and smoothest decay available, based on years of dedicated research and development. REV-X Hall, REV-X Room, and REV-X Plate programs are provided, with new parameters such as room size and decay envelopes that offer unprecedented definition and finer nuance control. The REV-X Hall and REV-X Room programs have a very open sound, while REV-X Plate delivers a brighter tonality that is ideal for vocals. All models deliver dense, warm reverb that does not interfere with the natural timbre of the source. Don't let its compact construction fool you— the 01V96i has tremendous mixing capacity for a console its size, making it extremely versatile and suitable for a wide range of studio and sound reinforcement applications. With up to 40 simultaneous inputs and 20 buses at 96kHz, the 01V96i delivers large console power in a rack-mount sized package. Offering a main stereo bus, eight individual mixing buses, two solo buses, and eight auxiliary buses —a total of 20 in all— the 01V96i gives you plenty of signal-routing options to adapt to just about any mixing requirements. Right out of the box the 01V96i offers 16 analog channel inputs—12 with improved studio-quality head amps-—and on the digital front, 8-channel optical ADAT, coaxial 2-track inputs and 16 inputs via USB. Analog outputs include the main stereo output, stereo monitor outputs, a stereo 2-track output, four OMNI outputs, 12 channel TRS insert points and a headphones output, matched with coaxial 2-track outputs and 8-channel optical ADAT for digital output. When you need more, Yamaha offers a range of mini-YGDAI expansion cards that can be inserted into the 01V96i’s expansion slot. From traditional analog audio formats to standard digital audio and dedicated third-party proprietary network protocols, Mini-YGDAI cards make it easy to add I/O in a wide variety of audio and network formats to 01V96i. When your situation demands a high capacity setup—particularly for live sound reinforcement applications— the "01V96i Cascade Link" allows you to run two units cascaded giving you up to 80 channels of mixing capability. One simple connection for all the power you would ever need. The benefits of digital technology are innumerable in terms of functionality, cost and space. However the physical, intuitive aspects of analog style mixers can never be discounted either. Our motto in designing the console: mix with your ears, not with your eyes. It was with this philosophy in mind that we made the best use of the technology at our disposal to offer digital features that make a difference, without overshadowing the familiar analog attributes of mixing. into any input channel as required. Centralized control means you'll never have to run around to physically re-patch cables whenever you need to reconfigure the system. Patch setups can be stored in the 01V96i patch library for instant recall at any time. 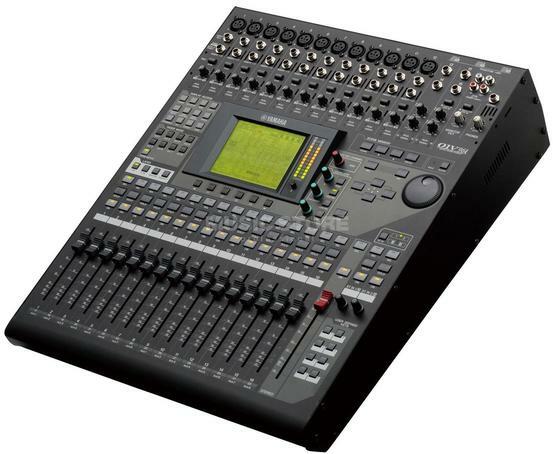 All of Yamaha's professional digital mixing consoles feature motor faders for a reason. A mixing engineer needs to be able to see exactly where levels are at all times, and without motor faders, every time you recall a previously stored scene or remotely control your mixer from external devices, the mix you hear will be totally different from what is represented by the faders on the console. This can cause considerable confusion and affect your workflow dramatically. Why run the risk of blowing your mix by compromising on such a crucial feature? Yamaha's 100mm motor faders are the end result of the extensive research and analysis put into making our top-line digital mixers. With the intuitive, physical control they afford, these precision faders will ensure that your previously stored settings not only sound exactly the same, but look just as they did when you saved them. What's more, multiple monitor mixes can be recalled and modified instantly and intuitively via the sends on fader function. “Selected Channel” controls are the "hands-on" channel controls for the currently selected input and output channel, with analog style buttons and knobs that allow you direct access and control of essential parameters. This Yamaha-designed configuration has become a classic as well the de-facto industry standard, and is familiar territory to most experienced engineers. One of the greatest advantages of digital control is that it adds extraordinary power and flexibility to your console without taking up valuable space. The 01V96i has 16 channel faders and one stereo master fader. 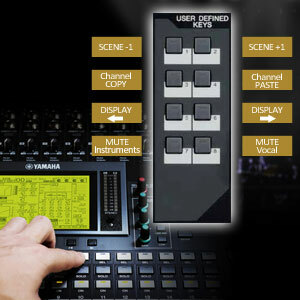 The channel faders can be instantly switched to handle input channels 1-16, 17-32, MASTER (8 AUX and 8 BUSES) or REMOTE via the console's LAYER switches. In the REMOTE layer, you can control major DAW software or create custom fader layers with which you can assign any in/out channels you like. The Fader MODE keys switch the 01V96i faders between fader and auxiliary level control instantaneously. Powered by fast, precise motor-driven mechanisms, the faders respond immediately by moving to the settings of the corresponding mode. In addition to being able to pair faders "horizontally," corresponding faders in adjacent layers can be “vertically” paired, allowing each physical channel fader to be used for stereo channel control. Multiple stereo channels can thus be controlled from a single layer with a whole list of linked parameters. The 01V has been used in a wide variety of applications due to its exceptional versatility. Highly customizable, the 01V96i can be configured to meet specific demands of various environments and greatly benefit your operation of the console. In live situations in particular, the console's personalized functions add a familiar touch while streamlining your workflow tremendously. You can group faders and mutes from any selected input channels or output buses and store the settings in multiple banks. The group function is very convenient for various applications including sound reinforcement. Eight user-defined keys allow you to customize how you interact with your console. These keys can be assigned to control any functions you choose. You could, for example, assign them to switch scenes, copy/paste channels or flip display pages and numerous other functions that can give you a tremendous advantage in live sound applications. The Instant Group Assignment function allows you to use these keys to set up mute group masters quickly— ideal for live applications where groups of instruments or sound sources need to be muted instantly. The ability to store and recall all console parameters in an instant is a huge advantage for sound reinforcement applications. You can instantly switch "scenes" during a performance, as well as recall the basic settings for a show at different venues, then tweak to optimize the sound for that environment. This can dramatically reduce setup time and benefit your workflow tremendously. All scene data can also be managed offline on a personal computer using the 01V96i Editor. You can do basic setup on your laptop, and then transfer the data to the console at the venue. 01V96i digital mixing console also lets you recall a scene with fade time, or apply “recall safe” for only the specified parameters and channels, or globally for added creative control and flexibility. There’s even a global paste function that lets you simultaneously paste selected parameters from one scene to multiple scenes – your EQ and AUX settings from final rehearsal, for example, can easily be copied to all other scenes that will be used during the performance. In addition to its extensive stand-alone capabilities, the 01V96i can seamlessly integrate with your computer-based DAW. In addition to the bi-directional 16 x 16 USB2.0 audio integration, the 01V96i also functions as a powerful controller for your Digital Audio Workstation (DAW). This provides that familiar hands-on feel when recording, mixing and editing your tracks. Control templates are provided for Avid ProTools®, Steinberg Cubase® and Nuendo® while the general DAW mode supports a range of other DAWs. MIDI control tables can also be created to provide compatibility with MIDI-compatible DAW systems. 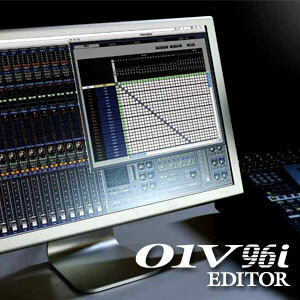 Available for MAC and Windows platforms, 01V96i Editor is a total management software package that gives you complete control of all the console's parameters via your computer. Editor provides comprehensive monitoring as well as real-time display of selected channel status once it is connected to the console and online. Offline you can edit and manage scene data, patch lists, and other functions for a significant boost in control and work efficiency. If you are using a rental or another installed console, you can easily save your settings to a computer, then load them into the other console at your convenience. 01V96i Editor also makes an effective tool for safely managing your backups.